finally! officially on chillaxation mode as i get ready this week for a long-awaited vacation. just in time too, as i've been feeling burned out from work and deadlines (and hence not blogging as much lately). summer is the best season for traveling light. my bf and i will be going to a friend's wedding first, then a little stop to Paris and Berlin. super duper excited. a good packing rule-of-thumb: only bring your tried-and-true favorites. my trusty travel essentials: Rimowa lightweight carry-on, vintage Celine small duffel, Karen Walker sunnies, Annabel Ingall trio mini bag, Tkees flip flops (on sale! ), and comfy go-to sandals. i've used the Rimowa on a few trips already, and it fits a lot more than it looks. unlike my last carry-on, it weighs next to nothing, and wheeling it around the airport is a dream thanks to the sturdy four-wheel design. definitely a worthy investment in travel comfort and style. P.S. : also doing some end-of-season closet cleaning – Boyy, vintage Coach, and more – check out the listings at my shop! to all my readers, if you have any fun/foodie/shopping tips for Paris and Berlin, please do chime in! I have been a notorious overpacker my entire life, so I am pretty proud that I will be using JUST my Virginia Johnson tote for a week in Maine. It would be impossible if I were going anywhere else, but a couple sweatshirts, a couple tshirts, shorts, and sneakers pretty much cover it there. i love VJ's designs - they're perfect for summer in Maine! Have a great trip! I'm going to email you a list of Paris recs. ooh. thanks for that rec. do they carry men's stuff too? Enjoy your trip! 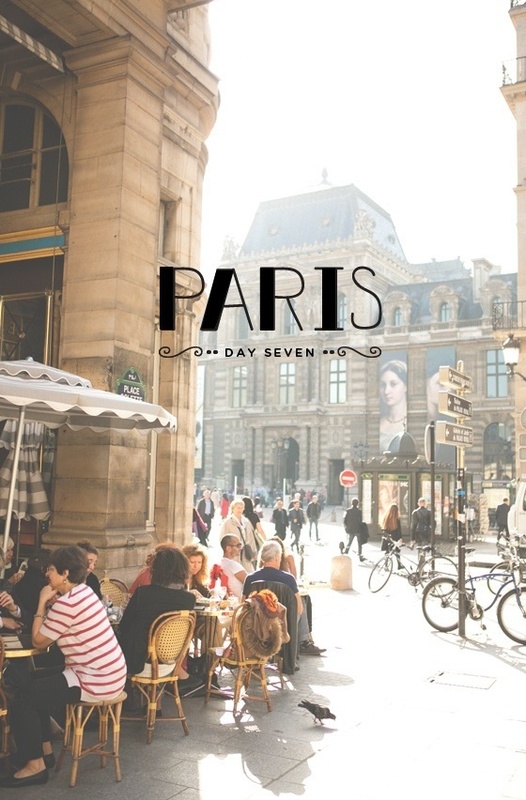 "Eat.Shop.Paris" is a great little book to take along with lots of recommendations. Ahhh I'm so jealous! Berlin was one of my favorite cities to visit when i was studying abroad, and even after visiting twice, I still have places I want to visit in Paris. i don't know if I have any atypical recommendations, but when I was in Berlin, we rented bikes and biked through tiergarten, and i almost couldnt stand how LOVELY it was. the backereis have a lot of yummy looking pastries for breakfast or a quick snack - the spinat strudel was my fave. In paris, I still haven't visited the catacombs, the musee d'orsay, the musee l'orangerie, or the Opera Garnier, but I want to go to all of those! Have fun! i've never been to Berlin so i'm really excited. i've heard SO many great things and i love that it's a really affordable European city and stays in the cool 70s in August! bon voyage! i agree on bringing a bigger suitcase. it's less stressful for vacation. hope you have fun in paris and berlin - both are great cities! Hey! I have the same Rimowa (same colour and all) and I love it! Traveled in France/Spain for 6 weeks this past June/July with just the carry-on -- a squeeze, yes, but it worked. . .
i swear my little rimowa cheers me up every time i'm in an airport and makes commercial flying a little more fun. its easily my new favorite bag. who knew vintage Celine was so good?? Oh I hope you have the best time! And I have to agree with that sentiment, take what you know. So many times I've taken things which haven't really been what I would wear at home and I end up feeling totally uncomfortable. I'd give you some tips but I think a lot of the fun is in exploring! Have a fantastic time. In Paris, definitely pop into the Musee d'Orsay, the Rodin museum and garden, and try the icecream at Berthillon. Berlin has a couple of amazing museums about the communist era and about life under the Stasi system, but my favourite was the Helmut Newton museum. Also, do go to the Holocaust museum - it's an incredibly moving experience. ooh, thanks for the Berlin recs. i'm totally going to the helmut newton museum. might do a walking tour of the city too. I love Paris and Berlin - such a great holiday because they both have such different vibes! I second the vote for the Stasi museum in Berlin, but admittedly they could do with more English-language information explaining the exhibits...I was with a German friend so it wasn't too bad. The walking tours are great, I highly recommend it just to orientate yourself around the city. Also, go to The Barn in Mitte for breakfast or a afternoon coffee break...it was my go-to for a great cup of coffee and the staff are really pleasant. It's not easy to get a good cuppa in Berlin, even though there's a tonne of cafes. Two restaurants I loved in Berlin are Horvath and Noto. The former is Austrian-German and got a Michelin star a few months after I went - the restaurant lacks atmosphere but the food and service is faultless. Noto is sort of German-Italian, and has a cool laidback vibe. Both need reservations and are worth the splurge. And at night, check out the Lido for gigs...I love the vibe of the place and last year I watched Tallest Man on Earth play there and it was amazing. Have a wonderful time! Sounds like you've got it all under control - I always just pack at the last minute. Sometimes I'm so good I feel like a mastermind, and sometimes I get there and see I've packed like someone with a head injury! Have to agree with you on the 4-wheeled carry-on though, I have a little samsonite one and it makes me so happy every single time. Have a great trip! Have a wonderful trip!! Looking forward to seeing photos when you return :) My parents have a Rimowa and love the set, I have been thinking about adding one as well..as much as I love my Globe Trotters they aren't as easy to use and open/close if I'm going to be fiddling with my luggage a lot. Have tons of fun in Paris. I didn't make it to Paris this year. I normally make a twice yearly pilgrimage there but I'm heading off to Provence soon. That photo of all the stuff you're bringing looks very similar to mine! Have a lovely trip! It seems like it was just yesterday that we were talking about the wedding at the blogger summit. You know how much I love Paris. I'm headed back for the gazillionth time in a few weeks. My favorite thing about Berlin is the contemporary art scene. There are so many wonderful galleries to explore.